Alas, the cafe closed at 3pm, so we headed back to the boat to tackle our one task of the day: motoring over to the fuel dock to fill our tank. When Todd began pumping the diesel, it quickly overflowed. “This nozzle is way too big! I think we’re at the wrong dock!” he cried. “Maybe we can just switch out the nozzle for a smaller one,” I offered helpfully. “Silly woman!” he snickered as he walked up the ramp to yell to the guy in the office. “The nozzle is too big. Am I at the wrong dock?” he asked the young man. “Just switch it out for the smaller nozzle!” came the reply. I tried to stifle the urge to mock Capn Brainiac, but the fluffy buttermilk biscuit with butter and jam had sapped my willpower. I rocked my head from side to side, and in a playground sneer I chimed, “Oh, maybe we’re at the wrong dock, naah naah naah!” That might explain why I was given the task of pumping the fuel, while Todd went below to “make sure the tank wasn’t too full.” Within a few minutes we were tanked up, yet I remained standing on deck in the pouring rain. After 15 minutes I respectfully inquired as to the holdup. Todd claimed to be adding biocide to the tank, but it wouldn’t take a Junior Trivial Pursuit Master to know that he was really down there sipping tea and doing his nails. I made a mental note to spit in his sandwich the next day. Lesson Two of cruising: Respect your captain’s authority. Never mock him to his face. Instead, save your snide remarks for the blog, and share them with his friends and family! I don’t know if you realize it, but it is both cold and dark at 4 in the morning! Nonetheless, I was the picture of cheerfulness as I put on my foul weather gear, which was still damp from the previous day’s dousing. I happily made a thermos of hot tea, with a little extra something for the Capn’s cup! As we navigated out of the marina, I took up a position on the bow with the spotlight. I think the pelicans and other roosting birds really appreciated the extra light, as they all flew off, fluttering their wings as if applauding us! 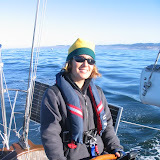 Koiya slept through the noise of Todd tromping around on deck, and the screech of the engine preheating, and the loud drone once we started the engine; but as soon as we left the shelter of the breakwater, we were rocked by a strong swell, and she popped her head up into the companionway. I had neglected to set out her warm clothes and waterproof pants, but she managed to find and struggle into them, as well as her pfd and harness, all as we rocked back and forth. She joined us in the cockpit, with the bright stars overhead. After about a half hour, she thought the better of it and went back into her berth for a little more sleep. She came back up again just as it got light, a little after 7am. Mike told me he met a guy who had years of experience sailing in San Francisco Bay, but this guy wouldn’t go out onto the Pacific, because it was “either tedious or terrifying”. While I wouldn’t call it “tedious”, it was pretty uneventful, as we motored along with no wind and not much of a swell. The swell died down even more, as we passed over the underwater canyons that are over 6,000 ft deep. It was beautiful though, and the jumping seals were entertaining. I took a nap on deck, Koiya rode the bowsprit and read in the cockpit, and Todd listened to his iPod. I tried knitting, but got a bit queasy, so instead I practiced my bosun’s whistle. As the sun crept higher, we really warmed up, to the point that Todd stripped down to a t-shirt and thong. Ok, really he was wearing jeans over his thong. Finally, just about 6 miles from Monterey, the wind picked up. As I was at the helm, I called for the sails to be set. “Ooh,” whined Capn Lazy, “but we’re just an hour out!” I guess I still haven’t learned Lesson Two, asking, “Are we sailors or are we sailors?” I thought it was my sparkling rhetoric that prompted him to action, but apparently Todd was guided by the nautical wisdom of “WWRD?”, or “What Would Rick Do?” (Todd’s buddy Rick Boyce is his sailing hero, a sailing purist who always does what a sailor “should do”.) Todd set the jib, and after a bit more prodding, the main as well. We were all glad he did, because the result was the most perfect entry to Monterey that we could have asked for: sailing in on a beam reach, under sunny skies. Though our trusty engine had served us well, we happily shut it off and enjoyed the peaceful sail. Well, peaceful until we got closer to the channel; Monterey was bustling with kayakers, a laser regatta, boats of all sizes, and the din of the sea lions! Yesterday we spent the day at the Monterey Bay Aquarium, where we saw their little “great” white shark, the huge bluefin tuna, the weird sunfish, and the always-adorable otters. We learned that you can tell the gender of mahi mahi because males have huge square foreheads (like Todd) and the females have delicate tapered foreheads (like homo sapiens). Sequoia got to be a contestant in “You Otter Know”, a game-show style presentation about sea otters. I have to put in a plug here for Seafood Watch: Download a seafood guide and keep it in your purse or wallet, so you can make healthy choices when you buy seafood! This entry was posted on Monday, October 15th, 2007 at 12:20 pm and is filed under Travel. You can follow any responses to this entry through the RSS 2.0 feed. Both comments and pings are currently closed. Also, there’s an awesome Korean BBQ restaurant in downtown Pacific Grove. Too bad I can’t remember the name. Todd – I think you have a very nice forehead. Sounds like smooooth sailing so far. Iris is in Big Sur for the next 4 days on a field trip, so if you really got stuck I’m sure the entire 4th grade would be happy to host you all at Heather’s ranch! Joel and I will be going out to dinner and the movies every night this week, so we’ll have many opportunities to drink a toast to the intrepid travelers!